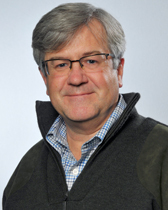 Dr. O’Halloran’s research interests center on the regulatory biology and chemistry of transition metal receptors involved homeostasis and oxidative stress pathways. His work focuses on the intracellular chemistry of elements essential for growth and proliferation, (i.e. zinc, copper and iron), nanoscale drug delivery mechanisms and on the mechanisms of clinically important anticancer agents that are based on arsenic, molybdenum and platinum chemistry. His discoveries have established the function and structures of two new classes of soluble receptors: metalloregulatory proteins that govern metal responsive gene expression and metallochaperone proteins that control intracellular trafficking pathways. Philips SJ, Canalizo-Hernandez M, Yildirim I, Schatz GC, Mondragón A, O'Halloran TV. Allosteric transcriptional regulation via changes in the overall topology of the core promoter. Science. 2015 Aug 21;349(6250):877-81. Que EL, Bleher R, Duncan FE, Kong BY, Gleber SC, Vogt S, Chen S, Garwin SA, Bayer AR, Dravid V, Woodruff TK, O’Halloran TV. Quantitative mapping of zinc fluxes in the mammalian egg reveals the origin of fertilization-induced zinc sparks. Nature Chemistry (2015) Feb;7(2):130-9. doi: 10.1038/nchem.2133. Epub 2014 Dec 15. Gilston BA, Wang S, Marcus MD, Canalizo-Hernandez MA, Swindell EP, Xue Y, Mondragon A, O’Halloran TV. “Structural and Mechanistic Basis of Zinc Regulation Across the E. coli Zur Regulon” PLoS Biology (2014). Nov 4;12(11):e10011987. Miodragovic DU, Quentzel JA, Kurutz JW, Stern CL, Ahn RW, Kandela I, Mazar AP, O’Halloran TV. “Robust Structure and Reactivity of Aqueous Arsenous Acid-Platinum (II) Anticancer Complexes.” Angew. Chem. Int. Ed. Engl., 2013. 52;1-5. Kim AM, Bernhardt ML, Kong BY, Ahn RW, Vogt S, Woodruff TK, O’Halloran TV. Zinc sparks are triggered by fertilization and facilitate cell cycle resumption in mammalian eggs. ACS Chemical Biology., Jul 15;6(7):716-23. Alvarez HM, Xue Y, Robinson CD, Canalizo-Hernandez MA, Marvin RG, Mondragon A, Penner-Hahn JE, O’Halloran TV. Tetrathiomolybdate Inhibits Copper Trafficking Proteins Through Metal Cluster Formation.Science. 2010 Jan 15;327(5963):331-4. Kim, A, Vogt, S., O’Halloran, T.V., Woodruff, T.K. “Zinc Availability Regultes Exit fromMeiosis in Maturing Mammalian Oocytes.” Nat Chem Bio. 2010 Sep;6(9):674-81. Epub 2010 Aug 8. Chen H, Pazicni S, Krett NL, Ahn RW, Penner-Hahn JE, Rosen ST, O’Halloran TV. Coencapsulation of Arsenic- and Platinum based Drugs for Targeted Cancer Treatment. Angew Chem Int Ed. 200948(49):9295-9299. Outten CE, O’Halloran TV. Femtomolar Sensitivity of Metalloregulatory Proteins Controlling Zinc Homeostasis. Science. 2001 Jun 29;292(5526):2488-92. Rae TD, Schmidt PJ, Pufahl RA, Culotta VC, O’Halloran, TV. Undetectable Intracellular Free Copper: The Requirement of a Copper Chaperone for Superoxide Dismutase. Science. 1999 Apr 30;284(5415):805-8.